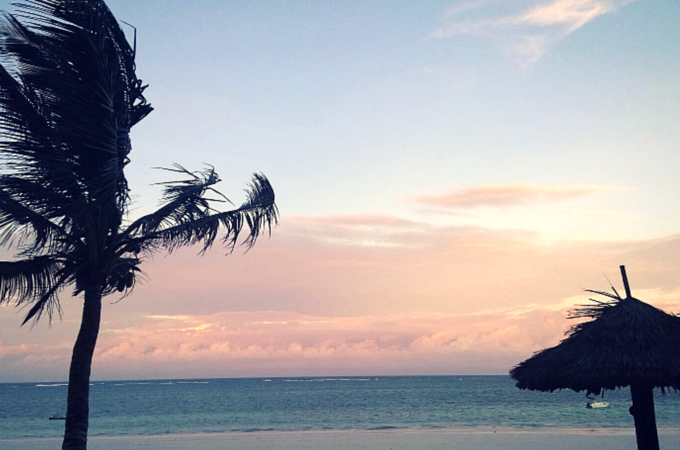 We drove through Diani as the sun was setting, the palm trees stark against the pink-hued sky. Night had fallen by the time the bus reached the poor suburb of Likoni, just south of Mombasa island. The muddy, pot-holed streets were still bustling after 7pm, full of people, tuk tuks, bicycles, and buses. Late night shopping was taking place by candlelight, and in a few cases, the glow of a naked light bulb. Over-ripe bananas were strung out above wooden market street stalls. Children were still traipsing past in pristine school uniforms, while women tended to pots heating over small open fires. I drank it all in, because I was leaving. Along with 400 other British tourists, I was being evacuated from the Kenyan coast. The news that the Foreign and Commonwealth Office (FCO) was now advising against all but essential travel to Mombasa (an hour north of Diani, where we were staying) was discovered in bits and pieces. Walking through the gardens to dinner at Diani Sea Resort on Wednesday, I remarked that the restaurant was looking unusually quiet. The hotel reception area, however, was full: clusters of residents talking animatedly, holidaymakers phoning home, Stacey (the local Thomson rep) surrounded by questioning faces. Information passed from person to person. As the FCO had added Mombasa to their no-go list, Thomson was sending us home – the next day. Without any concrete information, rumours spread like Chinese whispers, getting more extreme with each telling. Stacey eventually spoke to us all, dismissing the rumours of shootings and murders nearby, but saying that for our safety, Thomson was following the advice of the FCO. My first reaction was disbelief – I had been exploring the streets of Mombasa just yesterday! I didn’t feel unsafe, whether in Diani, Mombasa, or out on the open plains on a Kenyan safari; then again, I had always been with a local guide. I wondered if our bus journey to the airport – a convoy of tourist coaches, each with a police officer on board – would be different now, unsettling. It wasn’t. It was surreal, due to the circumstances, but no different to any other drive through Mombasa I had been on before. The streets were still chaotic. The stalls were still stocked. The roads were still bumpy. The Likoni ferry to Mombasa island was still as unbelievably crammed as ever. The only unusual addition was the presence of TV cameras at the airport. Evacuated. It didn’t feel like an evacuation, or what I would have imagined one to be like. Contrary to the fellow tourist interviewed on BBC News yesterday, I didn’t feel frightened. I felt sad: sad at leaving this incredible country earlier than expected, and desperately sad for the people – the hotel staff, the shop owners, the local tour operators – whose livelihoods, dependent on tourism, are being effectively destroyed by our departure. In my short time there, I learned that Kenya is a wonderful country, filled with beautiful landscapes and friendly people, and I can only hope – for Kenyans and tourists alike – that the security situation is resolved sooner rather than later. When it is, I’ll be heading straight for the Kenyan coast and the Indian Ocean, to finish the adventure that ended early. Have you ever been evacuated, or had to leave somewhere unexpectedly? Oh you poor thing! How terrible to have your holiday curtailed and be sent home… I hope you get to return very soon! I managed to miss this comment somehow! It was very disappointing being sent home, but I’m hoping that the travel ban won’t last too long and I’ll be able to visit again – it’s such a wonderful place! Wow, that’s not how you’d want to end a trip! So sad to think about the effects these travel bans have on the local people. Hope you get to make it back sometime to finish your travels there off. I know, we were so disappointed! And it is really sad how this affects locals. Our hotel was closing after we left, and one of the head chefs told us that without his job at the hotel, he was going to have to move out to the countryside and try and find work on a farm. Hopefully it won’t be too long until people can visit again, but with the recent news it’s not looking too good unfortunately. I was at footprints for 10 days in June last year not long after you returned. I felt no threat and I’m going back in August. All the same advice about staying away still stands. Ridiculous and sad! Felt safer there than 10 days at a kids home in Manchester!! Can’t wait to give Dotty, Njoki, Christine etc a massive hug!!!! Thanks, Jackie 🙂 I’m so happy to hear you’re going back to Footprints! And we never felt unsafe in Kenya either – it really makes you question the reasoning (and maybe politics) behind these kinds of decisions. Have a wonderful time, and please say hello and give the kids a hug from me!